In just over one week’s time, gorse joins up with other progressive Irish journals and publishers for Circa Words 2014, an experimental writing festival facilitated by the Irish Writers Centre. The brainchild of innovative writer and performer Dave Lordan, the weekend promises to be a good one. Join us for Circa Words 2014! 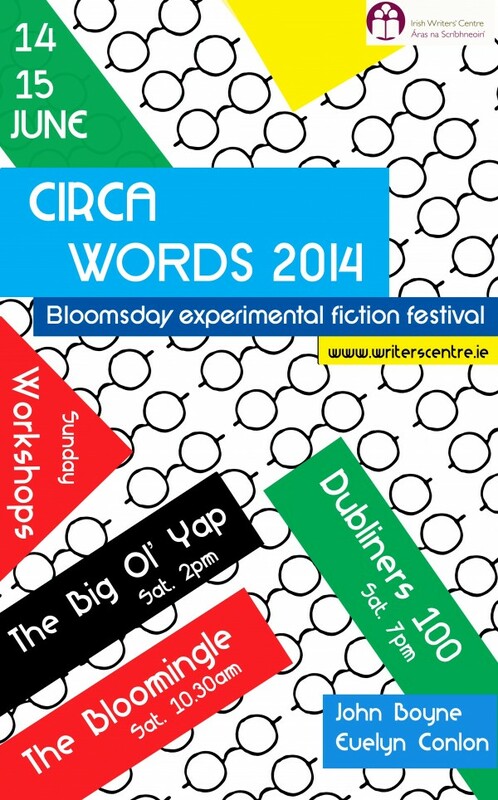 – a two-day experimental writing festival taking place over Bloomsday weekend. We’ll be paying homage to James Joyce as ‘godfather’ of experimental fiction by providing a space for contemporary experimental fiction writers, publishers and readers to meet, experience new forms of writing and even share their work. The experimental savant, the eager-to-learn-more, the experi-curious and the experi-unaware are all equally welcome! Don’t stray too far from Parnell Square North on the 14th as Circa Words runs from day until night. The festival begins on Saturday morning with a marketplace where teams from progressive journals will meet and ‘sell their wares’ to interested writers and readers. Budding writers will equally get the chance to pitch to journals in this give and take environment. We’re expecting a bustling morning with lots of networking and sharing of information. Prepare to unearth the hive of activity that is the Irish journal scene. Moderated by Dave Lordan, experimental fiction writer and teacher, this talk-shop delves into the experimental style; past, present and future. Writers and editors from experimental journals will discuss the viability and the relevance of the style. Does it belong in the mainstream? How has it evolved? Is it weird for weird’s sake? Expect discussions, disagreements and just a bit of chaos. Free event, suggested donations: €5. All welcome. Dubliners 100, published by Tramp Press, is a modern re-telling of Dubliners by fifteen contributing writers and celebrates the centenary of its publication. Join us for an in conversation event with authors John Boyne and Evelyn Conlon, and Thomas Morris who devised and edited the collection, as we discuss the challenges of picking apart Joyce’s stories and reinventing them as contemporary and individual. We’ll be there with John Holten, who’ll read from his roman fleuve ‘Oslo, Norway,’ excerpted in issue one of gorse.